I ended up buying the Orient Bambino that I blogged about here. I now alternate between it and my Sinn 556I, keeping whichever watch I'm not wearing in this watch winder. The Sinn's band is classier and its logo is more elegant than the Bambino's. It's easier to tell the time with the Sinn because its dial is so clear and uncluttered. It's impossible to stop the Bambino's seconds hand while setting the time on it. That's easy to do with the Sinn. Unlike the Bambino, the Sinn has a window in the back through which you can see its beautiful movement. However, the Bambino's dial definitely looks better from a distance. I don't know which one looks better up close - depends on my mood. They're both good. This is Universal Geneve tri-compax from the middle of the 20th century. 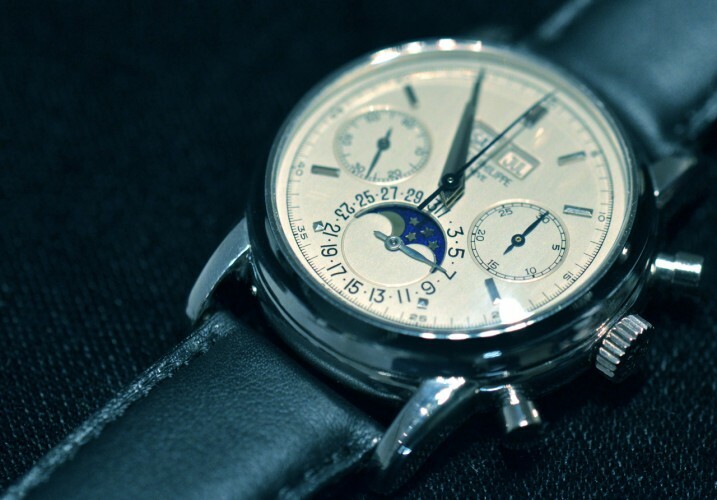 It costs $5,000 to $8,000 on www.chrono24.com depending on the condition. It feels wrong to criticize something so cool-looking, but I prefer to see the day of the month as a number in a window. That's easier to read than a dial with an arrow. 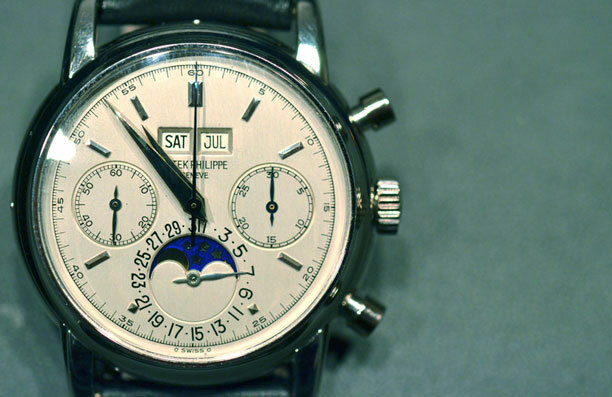 I use the day-of-the-month function of my two watches all the time. I'm signing some paper, I want to put the date there, a quick glance at my wrist - oh it's the 24th. 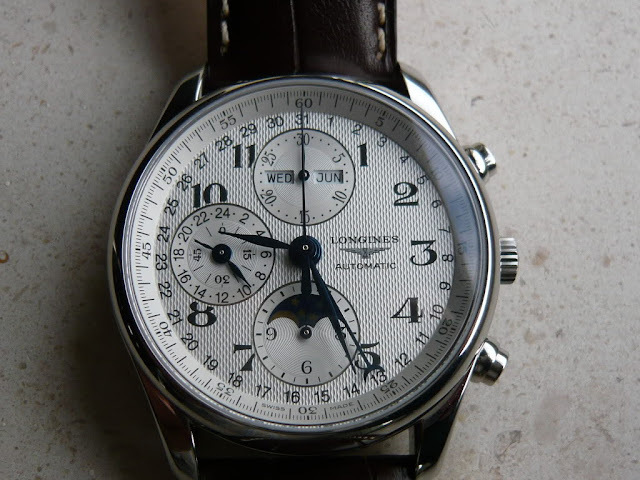 That would take more milliseconds with the dial-and-arrow setup at 12 o'clock in the picture below. 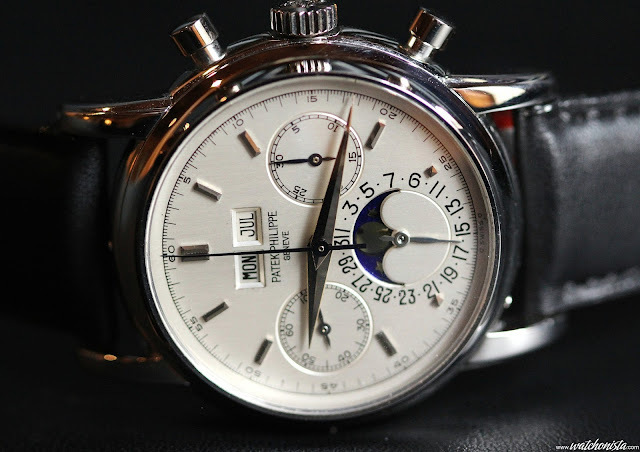 This is Zenith El Primero Chronomaster, which costs around $4,000. I like the existence of a number-in-a-window day-of-the-month indicator as well as its unusual size and position. The one unnecessary thing here is the tachymeter scale around the edge of the dial. Those are used to measure speed. I can only recall one time in my life when I wanted to measure speed in this way. Another one may never come up. 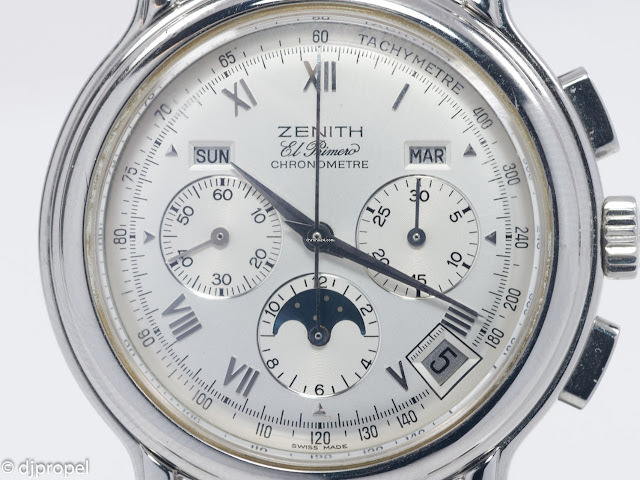 One cool thing about the El Primero is that its seconds hands (the running one at 9 o'clock and the chronometer's hand in the center) advance 10 times a second. 8 Hz is much more common. For some reason I do want the movement of these hands to be smoother. 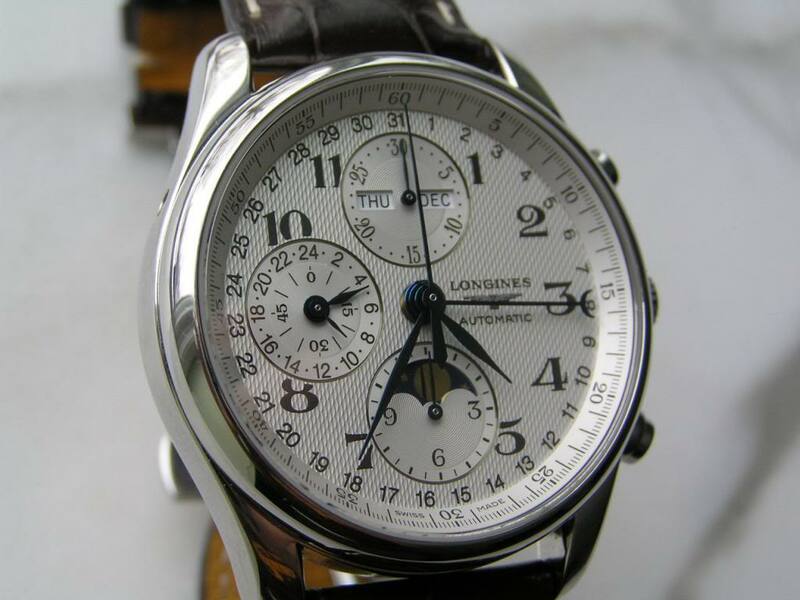 This is Longines Master Collection Triple Date Moonphase Chronograph. It costs about $2,400. I love that ripply finishing on the dial and the numbers representing the hours look cool, but the day-of-the-month problem is worse than usual on this watch. 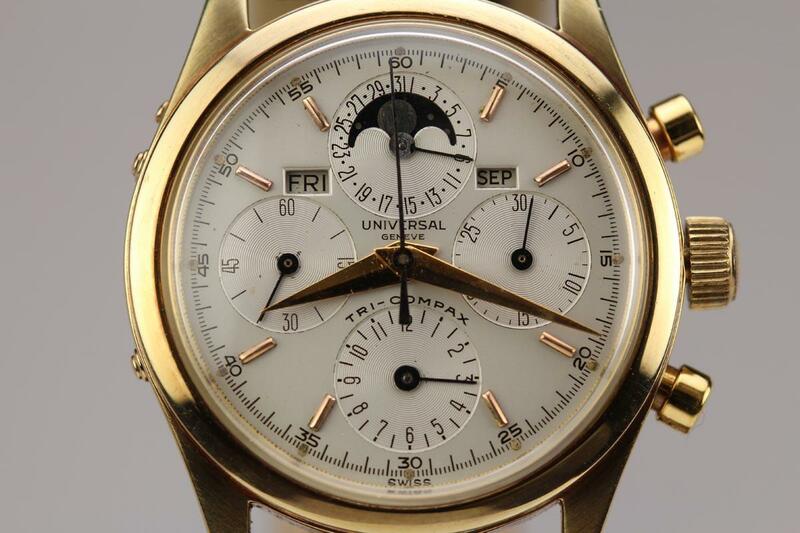 They have a central hand pointing to dates located around the edge of the dial. That makes the dial unnecessarily cluttered. It'll take more time than usual with it to tell the time. It's still a pretty cool-looking watch though. I sometimes go to lunch to the World Financial Center (next to, but not the same thing as the World Trade Center). There's an Omega store there. The best-looking Omega watch is the Speedmaster Professional, which costs about $3,500. There's something cool about its black shininess. However, it doesn't have any calendar features at all. 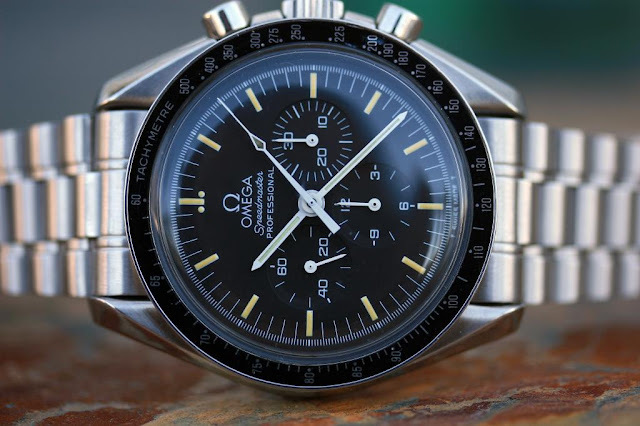 Omega makes Speedmasters that do, but they look terrible because these features are distributed around their dials in a clumsy way. 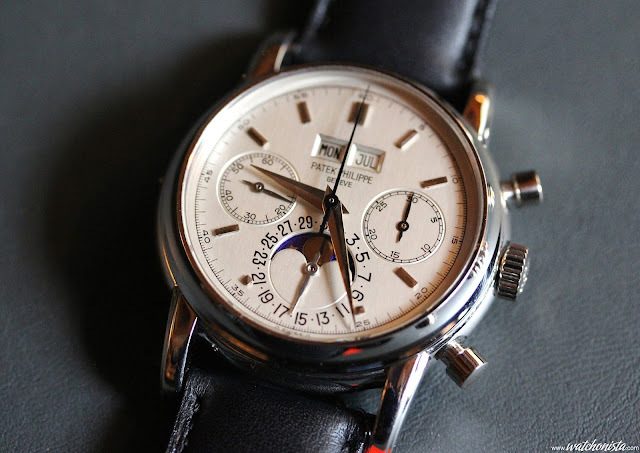 Also there's a tachymeter scale here, which, as I said above, I don't need. 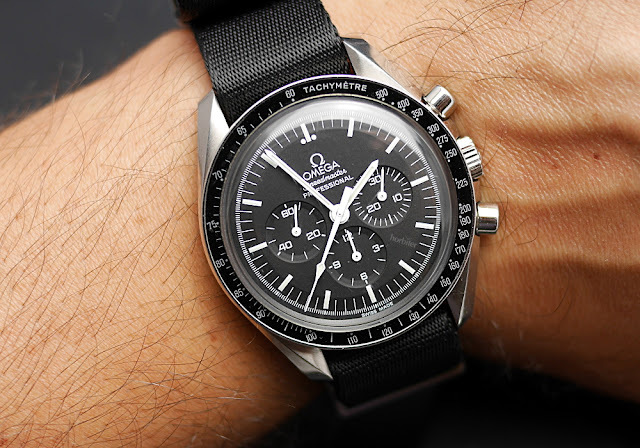 I guess there would have been no sense in calling this watch the Speedmaster without it. 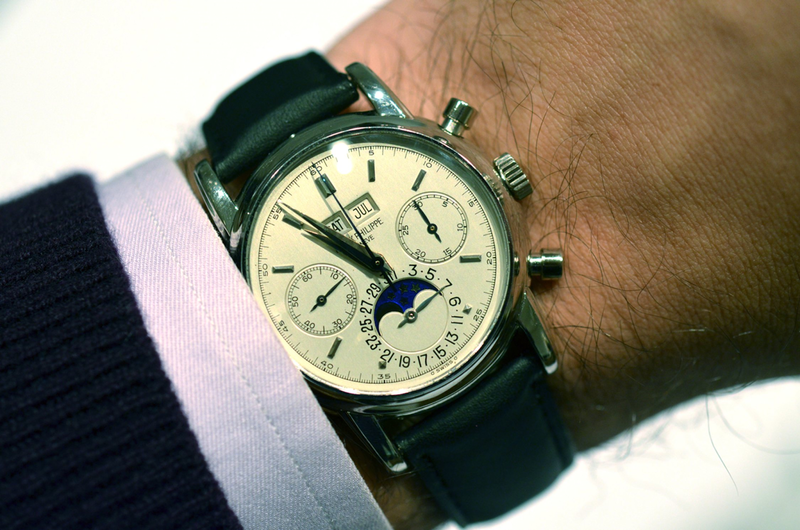 I posted some pics of Patek Philippe 5970 in my first post on this topic. 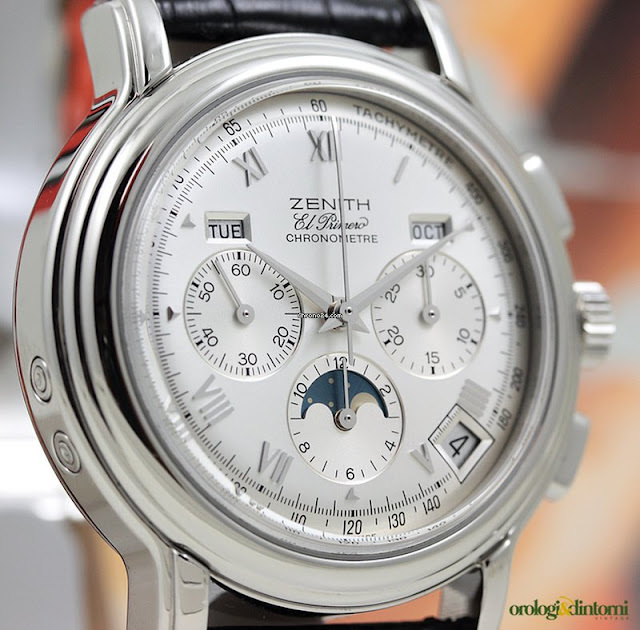 I'll end this post with pictures of the platinum 2499 that used to belong to Eric Clapton and which he auctioned off for $3.6 million in 2012. It truly is a beautiful thing.